The bobblehead doll is one of the more coveted fan giveaways at NHL games. At the very least, it's more a more substantial reward for one's patronage than, say, a schedule magnet. The San Jose Sharks have handed out dozens of iterations of these dolls but in recent years have given them a peculiar emphasis: turning them into a "content platform," according to said Doug Bentz, vice president of marketing and digital for the Sharks. "We've tried to change what the bobblehead means," he said. At first, that meant getting cheeky with them -- like a Marc-Edouard Vlasic bobblehead featuring the Sharks defenseman with a bunch of dogs as part of their AHL affiliate's "Pucks and Paws" night. Or, more infamously, the shirtless Joe Thornton bobblehead that was based on a viral photo of him strolling through Pittsburgh. Last weekend, it meant transforming the bobblehead from a ceramic knickknack collecting dust on your office shelf to something that delivers an interactive augmented reality experience ... while also collecting dust on your office shelf. The same technology that allowed you to catch a Pokemon in your living room now allows you to play an NHL player documentary, via his bobblehead doll. On Saturday, the Sharks handed out 17,562 Logan Couture bobbleheads to fans who watched them defeat the Edmonton Oilers6-4. At first glance, it looked like a normal giveaway -- Couture striking a pose, screaming in celebration after scoring a goal. But by going through the Sharks' mobile app and scanning a marker on the doll with their phones, fans were sent an augmented reality video that played next to the doll's base, showing a day in the life of Couture -- from breakfast through stepping on the ice for a game, all filmed with a GoPro camera strapped to his head. Bentz said that it's the first AR bobblehead by an NHL team and that it might be the first one in pro sports. The gimmick sprung from the Sharks' relationship with technology company Zeality, which created 360-degree video for the team's app and the helped the Sharks become the first NHL team with an Oculus Gear VR app in October. "We continue to be inspired by how the Sharks are embracing and enabling new content formats, experiences, and technology," said Dipak Patel, co-founder and CEO of Zeality. The Sharks loved the technology, especially using it with a video library that the franchise had built, "but we weren't seeing the interactivity," Bentz said. "What can we put on the canvas that fans will find interesting? What do we do that would make that meaningful?" Bentz said. "You not only have Logan's bobblehead, but you have a look inside his life as well." The Sharks also have a new way to offer their ticket buyers something exclusive. The marker will continue to function inside the app, which means that San Jose can upload new videos or other material to the Logan Couture bobblehead at any time. Fans who own the doll will be able to access exclusive Sharks content -- or, perhaps, even ticket and merchandise discounts, if the Sharks decide to send those out as well. "We're in the early innings of augmented reality. This is the first of many experiments of seeing where the sweet spot is," Bentz said. 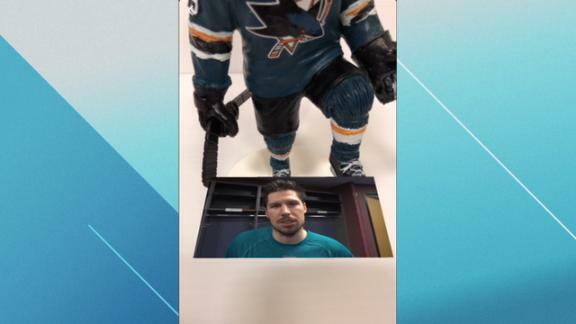 San Jose's recent Logan Couture bobblehead giveaway features a special augmented reality video viewable through the Sharks app.